The Standard Chartered 2012 Mumbai Marathon will be held in Bombay on Sunday, Jan 15, 2012. The 2012 Mumbai Marathon is the 9th such Mumbai Marathon. The marathon race categories, timings, route maps, directions, distance, prize money, fees are listed below. This is the full marathon category for professional marathon runners. In the men’s category, former world champion Luke Kibet, Kenyan’s Laban Moiben, William Kipsang, Nixon Machichim, John Kyui and Bernard Kosgei, Ethiopia’s Siraj Gena, Gela Hailu, Gemedu Haja, Moldovia’s Iaroslav Musinschi, will participant in the 2012 Mumbai Marathon. In the women’s category there will once again be a strong Ethiopian contingent with Makda Harun and Fatuma Sado. Giving company to them will be Namibia’s Hilalia Johannes, Kenya’s Lydia Rutto, Turkey’s Sultan Haydar and Russia’s Tatyana Vilisova. 2012 Mumbai Marathon (Elite) Start and End: The full marathon starts at Mumbai CST (VT Station) and ends at the same place. 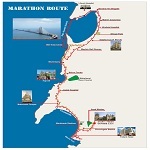 2012 Mumbai Marathon (Elite) Route Map: Please click on route map thumbnail too see the full map. Runners will travel via Marine Drive, Chowpatty, Pedder Road, Worli Sea Race, Sea Link bridge, turn at the Bandra Fire Station (under the bridge) and come back via Mahim causeway, Worli Sea Race, Pedder Road, Marine Drive and CST. 2012 Mumbai Marathon (Elite) Prize Money: Men & Women 1st Prize USD $36,000; 2nd prize USD $25,000, 3rd prize USD $ 16,000. Fastest Indian finisher gets USD $7,500. 2012 Mumbai Marathon (Elite) Age Eligibility: Minimum 18 years as on Jan 14, 2012. 2012 Mumbai Marathon (Elite) Fee: Indian participants Rs 700; foreign participants USD $ 45. This is the full marathon category for non-professional marathon runners. 2012 Mumbai Marathon (Open) Start and End: Same as the “Elite” marathon. The full marathon starts at Mumbai CST (VT Station) and ends at the same place. 2012 Mumbai Marathon (Open) Route Map: Please click on route map thumbnail too see the full map. Runners will travel via Marine Drive, Chowpatty, Pedder Road, Worli Sea Race, Sea Link bridge, turn at the Bandra Fire Station (under the bridge) and come back via Mahim causeway, Worli Sea Race, Pedder Road, Marine Drive and CST. 2012 Mumbai Marathon (Open) Prize Money: Men & Women 1st Prize USD $1,000; 2nd prize USD $750, 3rd prize USD $ 500. There are also prizes for Veterans (Men 44+, Women 39+) and Super-Veterans (Men 54+, Women 49+). 2012 Mumbai Marathon (Open) Age Eligibility: Minimum 18 years as on Jan 14, 2012. 2012 Mumbai Marathon (Open) Fee: Indian participants Rs 700; foreign participants USD $ 45. This is the half marathon category for non-professional marathon runners. 2012 Mumbai Half Marathon Start and End: The half marathon starts under the Bandra Flyover and ends at Mumbai CST (VT Station). 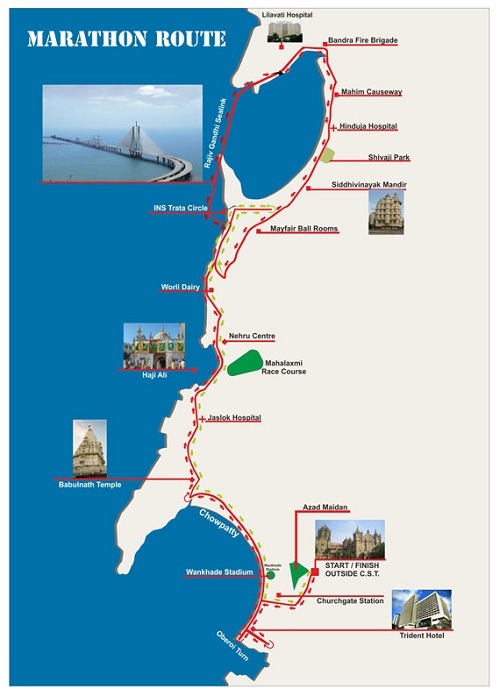 2012 Mumbai Half Marathon Route Map: Please click on route map thumbnail too see the full route map. Runners will travel from under the Bandra Flyover (near the Fire Station) to Mahim causeway, Worli Sea Race, Pedder Road, Marine Drive and CST. The route is the same as the return route of the full marathon. 2012 Mumbai Half Marathon Prize Money: Men & Women 1st Prize USD $2,000; 2nd prize USD $1,250, 3rd prize USD $ 900. There are also prizes for Veterans (Men 44+, Women 39+) and Super-Veterans (Men 54+, Women 49+). 2012 Mumbai Half Marathon Age Eligibility: Minimum 18 years as on Jan 14, 2012. 2012 Mumbai Half Marathon Fee: Indian participants Rs 700; foreign participants USD $ 45. The Mumbai Marathon Dream Run category makes the Mumbai marathon a participatory and fun marathon. People who are not long distance runners can participate and enjoy themselves. 2012 Mumbai Marathon Dream Run Start and End: The Marathon Dream Run starts at Mumbai CST (VT Station) and ends at Azad Maidan Gate Number 3. 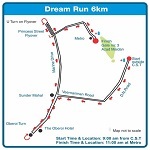 2012 Mumbai Marathon Dream Run Route Map: Please click on route map thumbnail too see the full route map. Runners will start from Mumbai CST to D N Road to Veer Nariman Road to Nariman Point and back to Marine Drive, U Turn from Charni Road Station, over the Princess Street Flyover to Parsi Dairy Farm to Metro and Azad Maidan Gate 3. 2012 Mumbai Marathon Dream Run Age Eligibility: Minimum 12 years as on Jan 14, 2012. 2012 Mumbai Marathon Dream Run Fee: Indian participants Rs 600; foreign participants USD $ 30. 2012 Mumbai Marathon Wheelchair and Senior Citizen Run Start and End: The Marathon Wheelchair and Senior Citizen Run start at Mumbai CST (VT Station) and ends at Azad Maidan Gate Number 3. 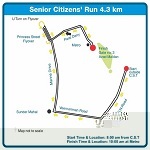 2012 Mumbai Marathon Wheelchair and Senior Citizen Run Route Map: Please click on route map thumbnail too see the full route map. 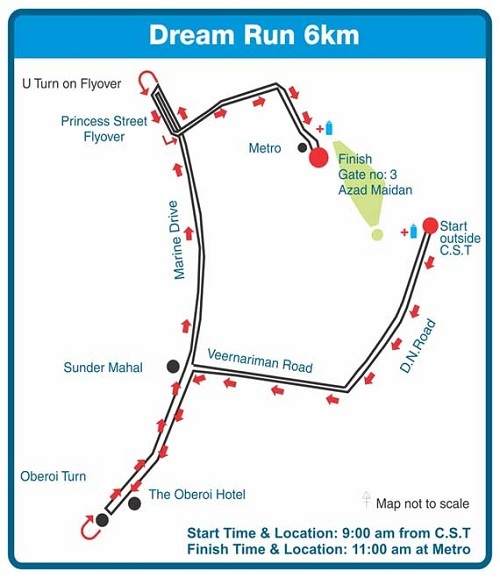 Runners will start from Mumbai CST to D N Road to Veer Nariman Road then right to Marine Drive, U Turn from Charni Road Station, over the Princess Street Flyover to Parsi Dairy Farm to Metro and Azad Maidan Gate 3. 2012 Mumbai Marathon Wheelchair and Senior Citizen Run Age Eligibility: Minimum 12 years as on Jan 14, 2012 for Wheelchair run and 60 years for Senior Citizen run. 2012 Mumbai Marathon Wheelchair and Senior Citizen Run Fee: Indian participants Rs 300; foreign participants USD $ 15. Marathon participants are encouraged to come out in interesting costumes. Kingfisher will give a “Bindaas Bandhe” first prize of Rs 50,000 and second prize of Rs 30,000 to the best group costume (minimum 10 participants). Kingfisher will also individual Green Crusader eco-friendly costume prizes of Rs 20,000 (first) and Rs 10,000 (second). The top three best individual costumes will earn Rs 30,000, Rs 20,000 and Rs 10,000. Costumes will be judged between 7:55 am to 8:45 am at Azad Maidan.